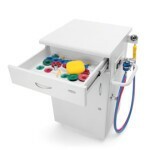 Ekopompa is a water recirculation massage unit compatible with Medimark Aquavibron. The device allows the ecological usage of water to create vibrations of the membrane in the Aquavibron unit (water recirculation). A special pump keeps the appropriate level of water pressure and the capacity of the tank up to 10 litres. 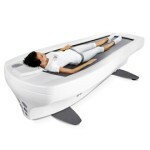 Aquai is a multifunctional membrane massage unit. It is used in Medical SPA and fitness centres, beauty spas and rehabilitation practices. The device is used for dry hydromassage (or dry massage). The membrane, which the user is lying on, gets hit with the water coming out through nozzles.